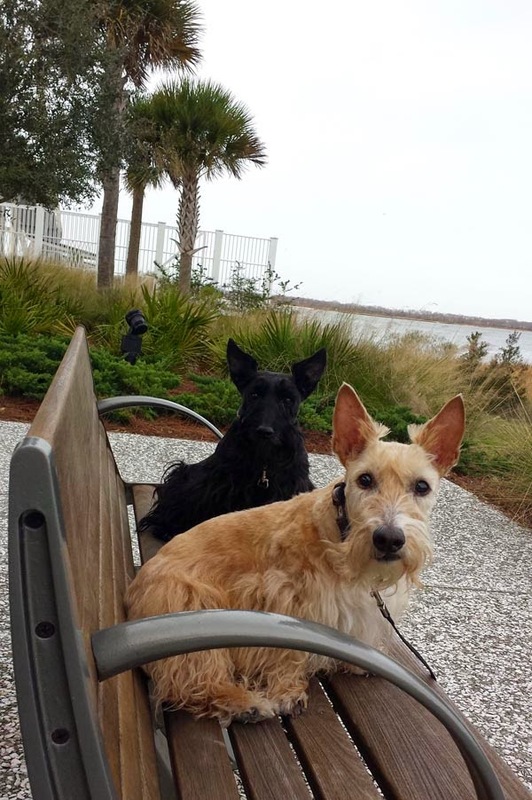 On our final morning in the Charleston area, Scottie Dad and I took the fur kids to the pier in Mt. Pleasant. The sights, the smells and the noises all sparked Heather and Mr. K's interests from the moment we arrived. They walked side by side, tails pointing up to the sky, wagging back and forth as we neared closer to the pier. We stopped along the way to take these photos and just as we were about to move on down to the pier, we saw the sign: "NO PETS ALLOWED." I was surprised by this sign. So far, Charleston and Mt. Pleasant had been very pet-friendly. Why were no dogs allowed on the pier? A German Shepherd Dad came by on bicycle only to turn around with his pup at the sighting of the sign as well. This, by far, was the biggest disappointment of the trip. We had been looking forward to showing Heather and Mr. K the pier since we hadn't gone to the beach, much to their dismay. Since there really wasn't time to do much else that day, we all jumped back into the car and began our five hour journey back to the Scottie House. Rest assured, our trip was still a wonderful break from life in Atlanta. Our only regret was that we didn't have more time to explore. We fully expect to visit again, try new places and report our findings back to Scottie Mom friends. That being said, have you been to Charleston with your pups? What places do you recommend we stop and see next time? 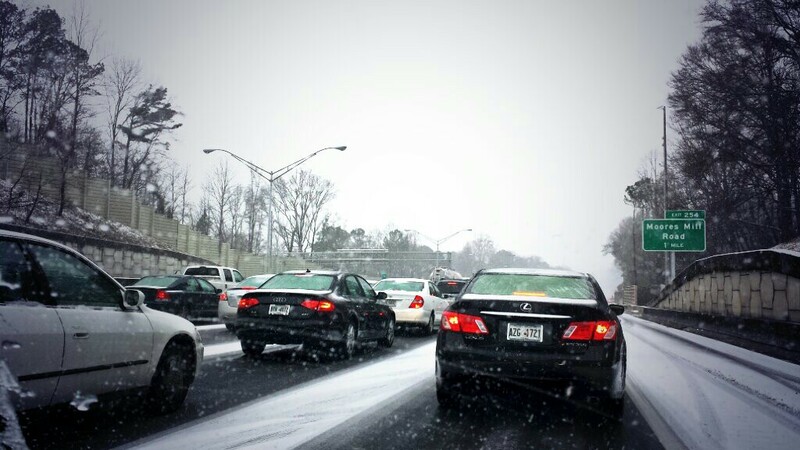 When I heard snow was coming to Atlanta, I could not have been happier. 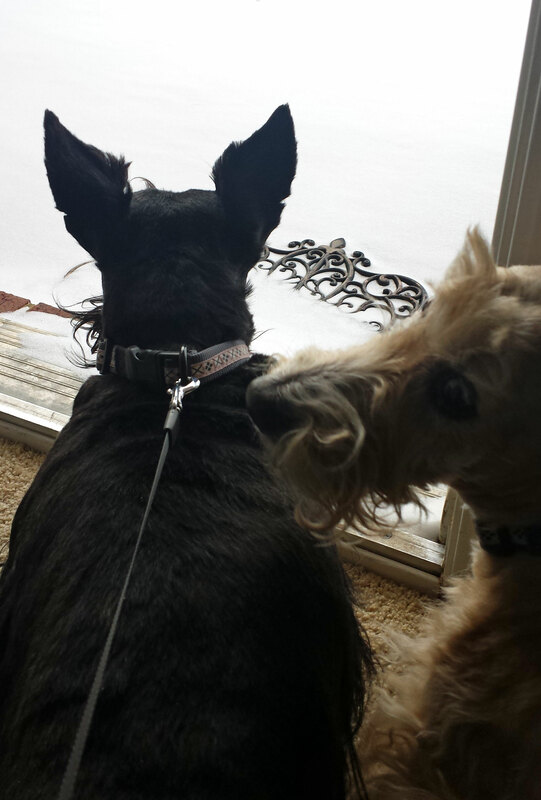 Until now, Heather and Mr. K never really got to enjoy some play time in the snow together and I just knew some fantastic photos were just waiting to be taken so we could share them with our Scottie Mom friends. Unfortunately, things didn't go as I had hoped. I wasn't home before the sun set to snap a few photos. In fact, I wasn't home for the evening walk or even for Scottie dinner time (GASP!). Despite the fact I left work around 2 p.m. and the drive is typically about 15 minutes, it took me a grand total of six hours to get home to my pups...that's longer than our trip to Charleston! 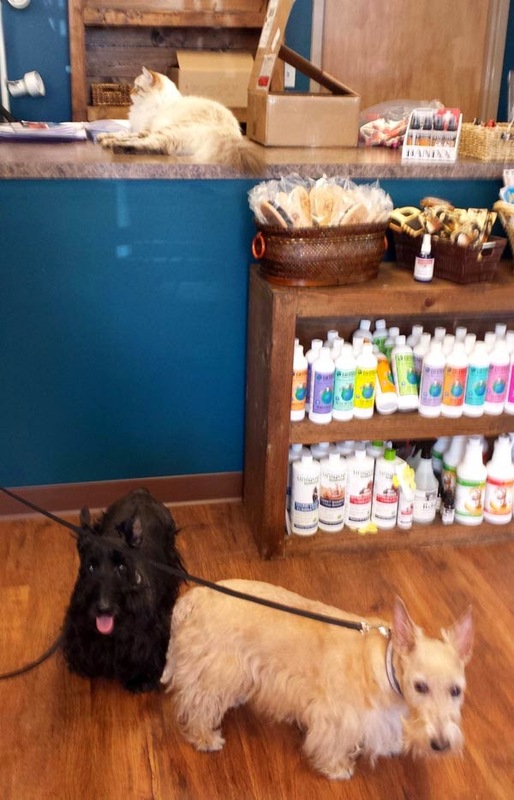 Heather and Mr. K did their best to hold their small bladders but a Scottie's gotta go when a Scottie's gotta go. I came home to a few small accidents. Almost as soon as I came through the door, we were heading back out it. Heather made it just outside the garage and onto the driveway before she couldn't hold it anymore. And Mr. K, I swear he peed for a solid five minutes. What took so long for me to get home, you ask? Well, in a nutshell (and in case you haven't seen it all over national news today), Atlanta - the city Heather and Mr. K reside in - was and probably will always be ill-prepared for events like this. 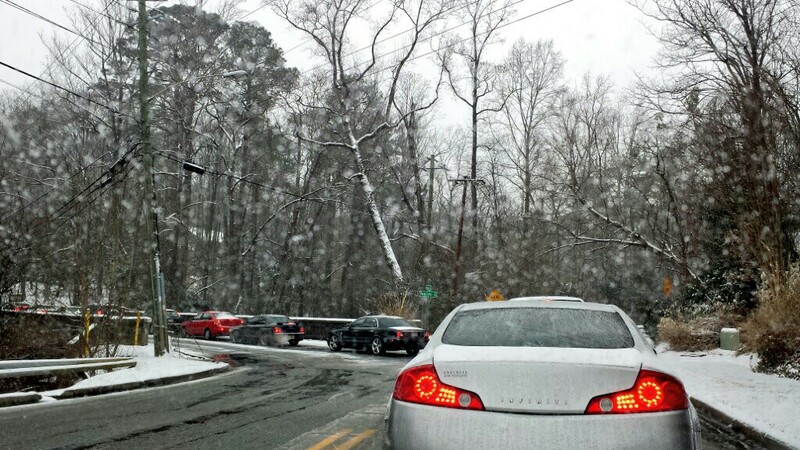 We only got two inches of snow but it was enough to shut the city down and cause a gridlock across the region. 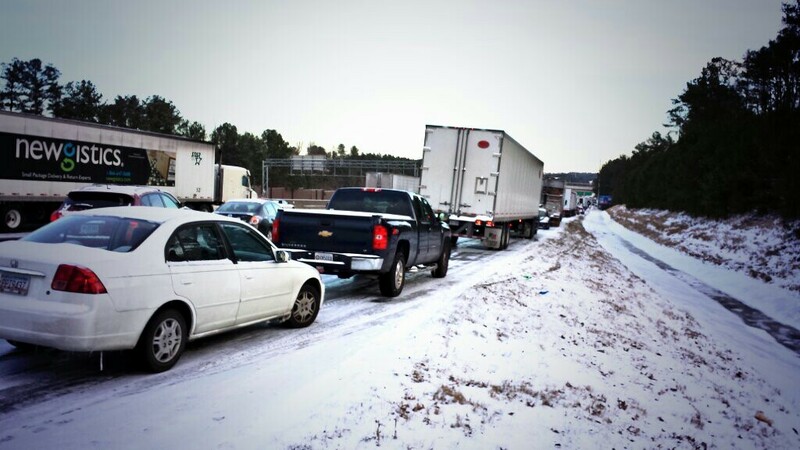 Children slept overnight in schools, drivers either slept on the highways or abandoned their vehicles to seek shelter elsewhere and it is reported there were over 1,250 accidents since the snow starting falling yesterday afternoon. Friends, I cannot even begin to explain how stressful the past 24 hours have been. The frustration of sitting in traffic that long, the anxiety that comes with knowing you need to be somewhere but there literally is nothing you can do, and the shock and awe of watching inexperienced cold-weather drivers attempt risky and dangerous maneuvers that could put your life in jeopardy took quite the mental and emotional toll on me...hence, why we took the night off last night! You might remember Lucky the Shih Tzu who comes over to hang out with Heather and Mr. K every once in a while. Unfortunately, his Shih Tzu Mom got stuck on another highway close to the Scottie House and had to sleep in her car under a bridge. When she woke, the people in the cars next to her hadn't moved but a few inches. All she had for dinner was a mint and some water. So, when I woke at 5:30 a.m. and found out she was still out there, I dressed in heavy layers and packed a bag full of provisions and blankets to take to her on foot. The roads were deserted, completely covered in ice. I nearly lost my footing twice on the way there. 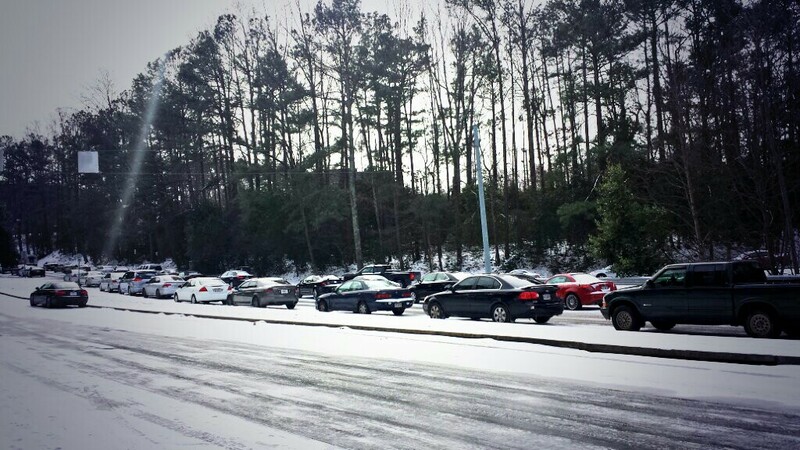 I wasn't at all nervous until I came to the interstate ramp and saw just how many cars and trucks were stranded. It was like something out of a bad apocalypse movie. I only had food for Shih Tzu Mom, not all these people! For a brief moment, I thought about how crazy I was for doing this. What if one of these trucks didn't see me walking or a car slid toward me on the ice? I pushed forward and shuffled my way down the highway ramp, moving between ice patches on the highway itself and snow covered sides of the road. I had to walk around abandoned cars, parked this way and that. Then, I saw the bridge and about another half mile or so later, I arrived at her car and was delivering the goods. I stayed there for a good four hours to keep Shih Tzu Mom company before making the long and slippery trek back. I tweeted a few things about the horrible conditions surrounding us and CNN called to talk to Shih Tzu Mom. Poor Lucky was home alone all night and even much of the day today. He did have food and water, but no potty breaks or walks for over 24 hours. The amazing part: that little angel held it the whole time. When his Shih Tzu Dad finally got home, he hadn't had an accident yet and, even when he was brought outside, wasn't sure he wanted to go even after all that time because of that chilly, white stuff on the ground! After 21 hours on the road, Shih Tzu Mom finally made it home to snuggle with Lucky and Shih Tzu Dad around 3 p.m. today. I left Shih Tzu Mom on the highway around noon. We had made it to the next exit (keep in mind Shih Tzu Mom was already halfway there when I found her - it took us four hours to move a half mile). Again, I walked down the ramp but wasn't so successful in maintaining my footing. As I was on the phone with CNN once more, my feet slipped from underneath me and down I went right there on the ramp. 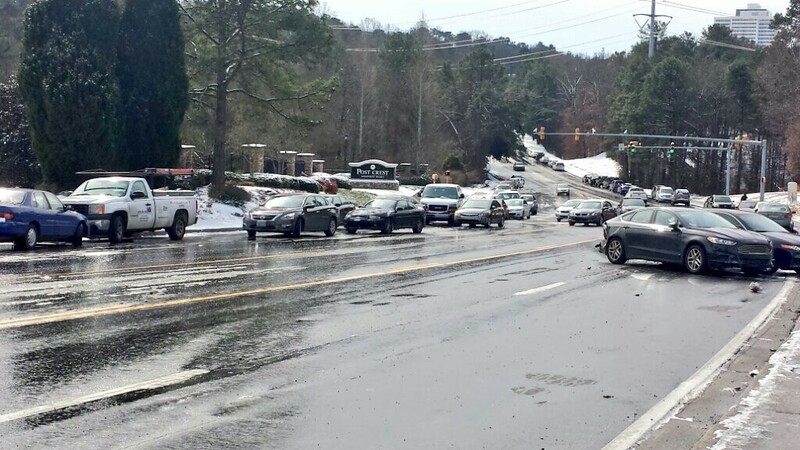 When I got to the end of it, I couldn't believe what I was seeing: so much more ice, so many more abandoned cars and lots of people still spinning tires in place. When I got to the street my neighborhood is on, I stopped to snap another photo of the road I had to maneuver the night before. Cars abandoned on either side of the road heading up the hill, the Scottie Mobile and I barely had enough room to make our way to the Scottie House but we had experience and good fortune on our side. It looked bad at night but it looked so much worse when I saw those dozens of cars again in the morning - one still running (but no one inside)! In closing, I wish everyone a safe, warm and comfortable night in the company of your darling pets! Heather and Mr. K really worked their magic and helped me to relax and calm down a bit once I got home last night. Scottie Dad's flight was moved so we hope to be reunited with him tomorrow. As promised, pictures from our Charleston trip will post soon as well as a few from play time in the snow I was able to snap later in the afternoon today. Much love, The Scottie Mom. As I mentioned in last night's post, just a few steps away from our hotel in Mt. 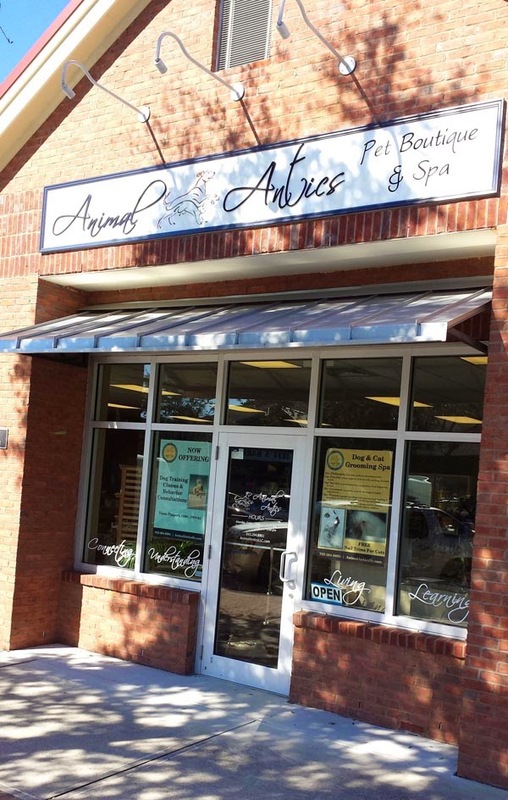 Pleasant, South Carolina was a pet spa and boutique. Naturally, we just had to check it out for our friends. And so, the four of us strolled over to the shop on Saturday morning hoping to score some goods. When we opened the door, we were surprised to be greeted by a beautiful (and not-so-evil as Mr. K would have you believe) C-A-T. I was ready to turn around and walk out but Scottie Dad said to have a little faith in Mr. K and keep him on a short leash. That's exactly what we did. In fact, I'm pretty sure Mr. K thought the pretty kitty wasn't even a real C-A-T at first. That, or he was simply too distracted by all the toys and treats by which he was surrounded. Eventually, the C-A-T wandered over to say hello and Mr. K did let out a soft cry at the realization he was encountering yet another C-A-T. Despite this devastating fact, Mr. K decided to behave and the C-A-T walked his way over to the cash register to help us check out. Notice in the picture above Mr. K quickly forgot the existence of the C-A-T once he was out of sight! We picked up a small box of treats from this cute, little store that had everything from bath products, cat and dog treats, collars, books and more. 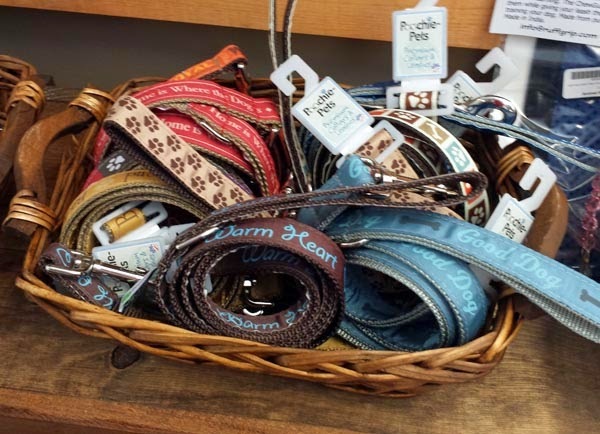 My favorite product in the shop was a blue and brown leash (that had a matching collar) that read: Warm Heart, Cold Nose. I was so tempted to pick it up but I really can't pass up the convenience of the double leash I currently use to walk my two Scotties. And, as can be expected, Heather and Mr. K absolutely refused to wait very much longer to tear into their newly found, yummy treasures! What's next: Though it was too cold for us to venture to the beach again, Heather and Mr. K did journey to the local pier and posed for some incredible photos. Stay tuned to see those tomorrow! If you don't find the right hotel accommodations, vacationing with fur kids can be just as stressful as having to board them if you're like me and are plagued by anxiety any time you have to leave the furry ones behind. 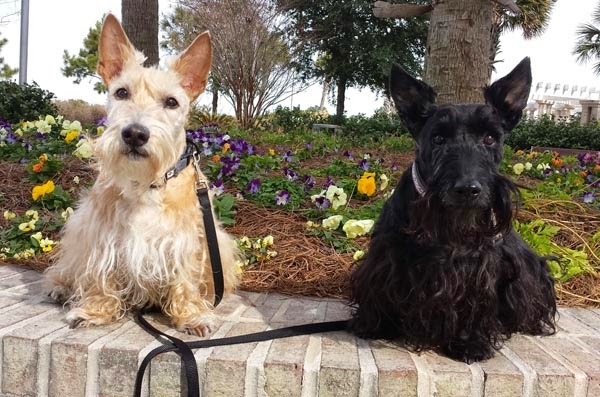 So when Scottie Dad and I decided to have a weekend getaway and go visit friends in Charleston, South Carolina (who recently welcomed to their home a fur kid of their own! ), we got to work researching dog-friendly hotels. One chain of hotels we don't often consider, despite the fact Scottie Dad has a plethora of points, is Hilton Hotels & Resorts. Historically, we have not found many hotels in that chain to be pet-friendly and, if they are, the fees tend to be a bit outrageous. Yet, we somehow stumbled upon Homewood Suites in Mt. Pleasant, South Carolina - just a few miles outside the city of Charleston. I have to admit: I owe all the credit to Scottie Dad for this great find. The room was plenty for our small family. There was a living room and kitchen, then behind another door was the bedroom and bathroom. Heather and Mr. K slept snuggled up in their Scottie beds in the bedroom with us. And during the day, I could rest assured knowing they could roam free and not be bothered, thanks to a magnet the hotel provides that lets the staff know there are family pets inside. Surprisingly, nearly every room on our floor had the magnet displayed. It was encouraging to see so many pets vacationing with their families! Even more surprising: we never encountered any of our temporary neighbors or heard a bark from behind closed doors. Although there weren't any pet perks (besides the comfort and pleasure of having Heather and Mr. K right there with us!) offered by the hotel itself, the location pretty much makes up for that. Not only was the area pretty quiet but this Homewood Suites is located in a cute shopping plaza which was complete with restaurants galore - where we saw a Labrador Retriever pup eating lunch with his Mom and Dad, a pet spa and boutique (more on that later! ), and a V-E-T office. How comforting is it to know that help is literally a few steps away in the case anything happened? 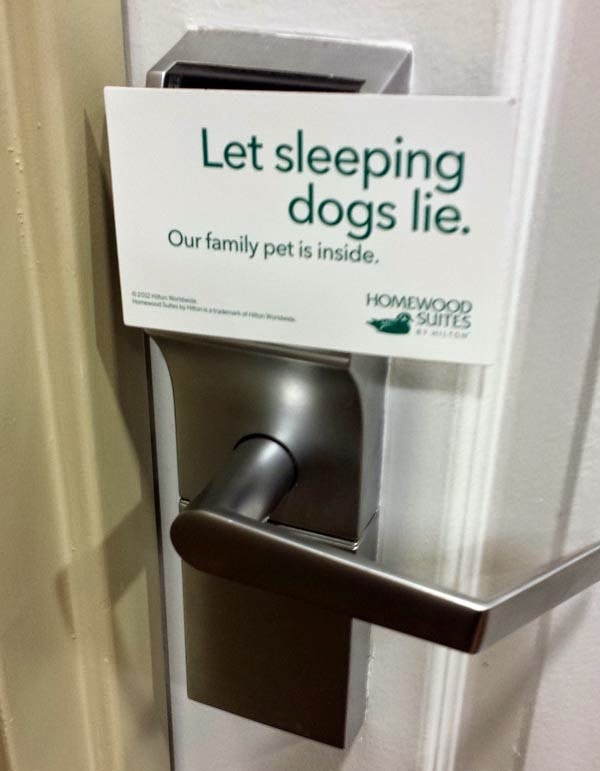 The nonrefundable pet fee for Homewood Suites in Mt. Pleasant was $75. 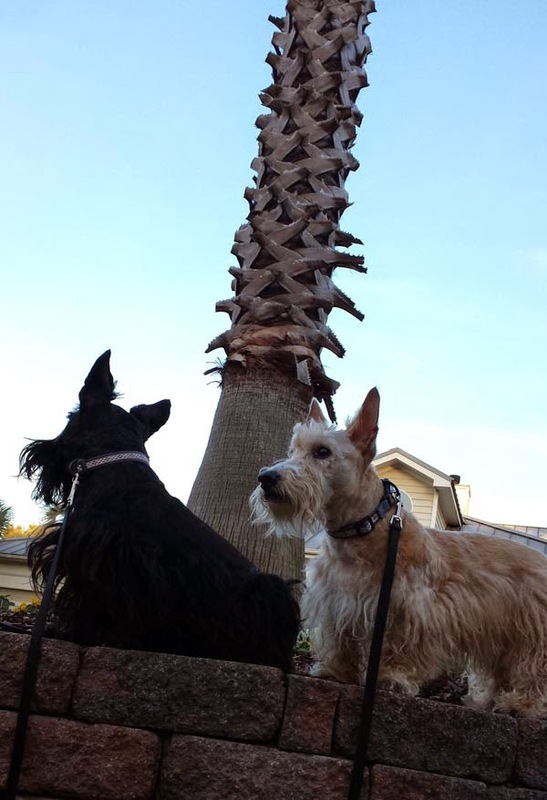 When compared to the cost of keeping Heather and Mr. K at their favorite boarding facility Pet Paradise (which typically runs me $105 a night for both Scotties to sit pretty in the presidential suite), it doesn't look so bad! Although, I think there's a strong possibility Mr. K might actually prefer to be boarded there as it comes with an abundance of play time, an ice cream treat and did I mention lots of new fur-iends? Heather, on the other hand, definitely prefers to stay by her Scottie Mom's side. Stay tuned for more stories and lots of fantastic photos from our weekend getaway in Charleston! 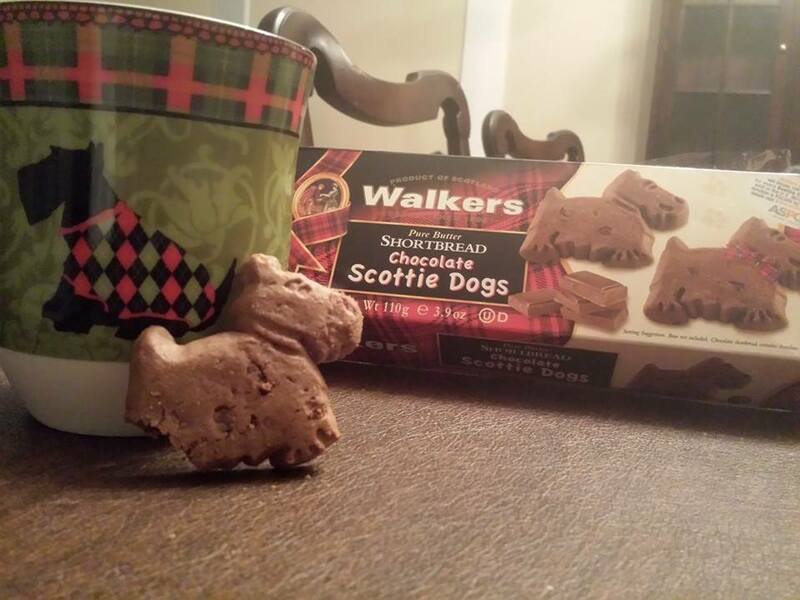 Scottie Moms, beware: Walkers Shortbread has done it again! I think they've caught on to our obsession with Scottie dogs and our innate desire to buy up everything Scottie. After the Scottie dog-shaped shortbread cookie proved to be one of their most popular products, they introduced the chocolate variation (my personal favorite!). Now, they've recently announced they intend to unveil Scottie dog "puppies" - a miniature version of the larger Scottie dog shortbread cookie. Well, at least this time, they're being considerate of our hips! According to the release, there will be 42 bite-sized shortbread cookies in each re-sealable “grab and go” bag. The new cookies retail for $3.49 each and will be available for purchase beginning February 1, 2014 on the Walkers Shortbread website and in select specialty retailers throughout the United States. (Scottie Dads, take note: Valentine's Day is just around the corner! Why not surprise the Scottie Mom in your life with a bag of these new "puppies" or make a cookie bouquet of the larger Scottie cookies?) - No, Walkers Shortbread did not pay us to write that. 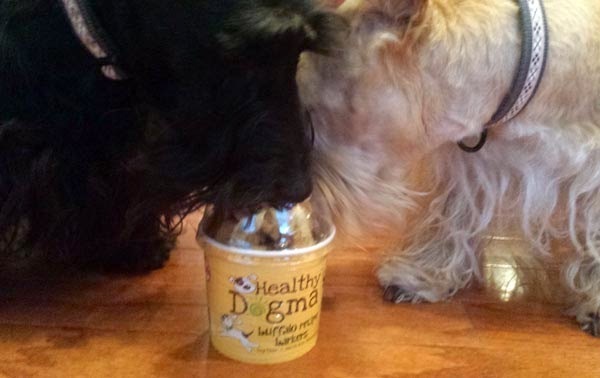 We're just trying to help increase the Scottie Love in your household! 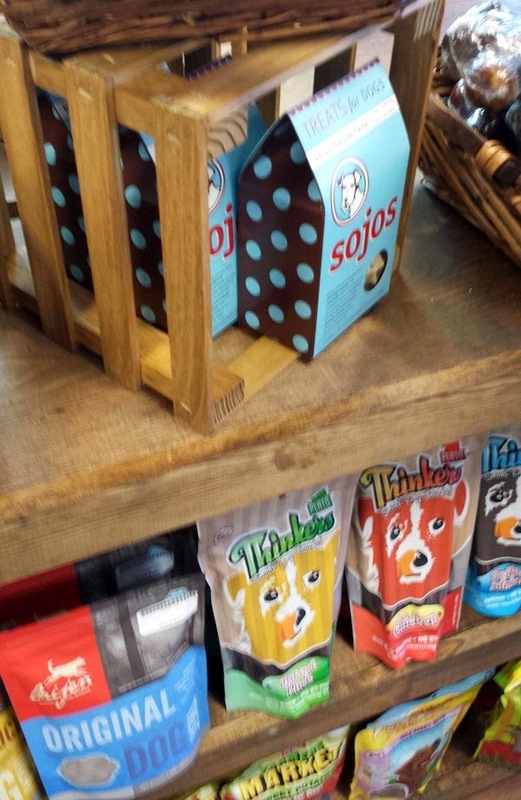 When we introduced the original Scottie Dog shape in 2012, we never imagined that little dog would quickly become one of our best selling items; it was only natural for us to expand the line to include a chocolate version and now a mini-version,” said Lisa Sherman, brand manager at Walkers Shortbread. “These Mini-Scottie Dog ‘puppies’ are a perfect snack for kids and adults who are looking for a fun way to satisfy their cookie cravings." Who says newer is always better? Antique Scottie finds can be just as fun! 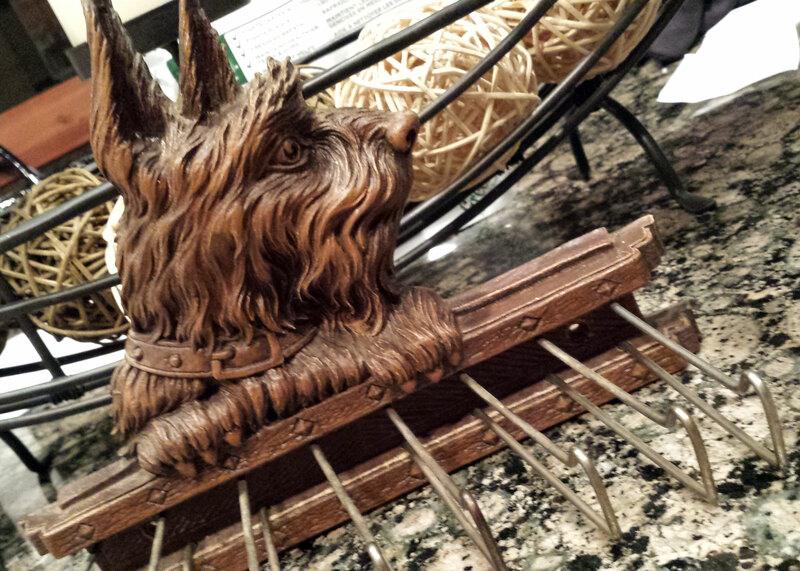 Recently, Heather and Mr. K's Scottie Great-Grandma sent us this tie rack and figurine (pictured above) that she came across at what she affectionately calls her local "junky junk shop." She stumbled across these two Scottie finds and immediately thought of Heather and Mr. K. So, she scooped them up and sent them on their way. Upon opening the package, Heather knew right away that the figurine represented her and gave it a kiss on the face! Mr. K hasn't decided what to thing of the tie rack yet but he did propose two potential plans for its use...let us know which one you think is best! 1) As you know, Heather and Mr. K are not allowed in the master bedroom (unless, of course, Scottie Dad just happens to be away...!). But there is no rule saying they can't be represented in their absence! Mr. K's first idea was to hang the tie rack in the master bedroom closet - you might remember us unveiling the newly designed feature in Project Runway: Scottie Edition - so that every morning when Scottie Dad goes to grab a tie for work, he is reminded of his precious furkids! 2) Now, the problem with Mr. K's first idea is that the Scottie cuteness wouldn't be displayed for all the world to see as people enter The Scottie House. The tie rack could easily be converted to hang Heather and Mr. K's assortment of leashes by the front door. Not only would that be a reinforcement of the Scottie image right there as you walk through the door, but everyone would know whose house this really is! Hmmm...decisions, decisions! What do you think? Scottie Mom cut it close tonight. That's right - not only had she let the kibble run dangerously low (and by dangerously low, we mean less than enough to feed us until our tummies are content) but she also came home late from work. 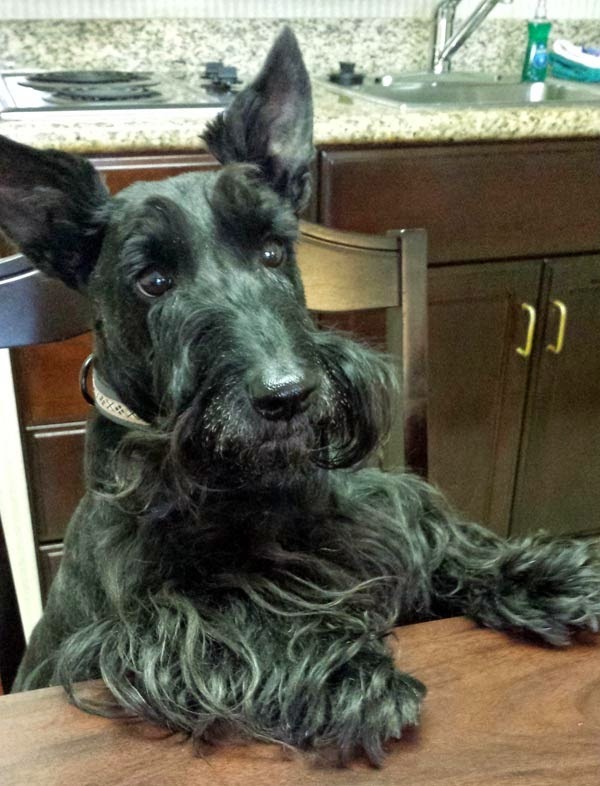 All we have to say about that is: a Scottie's gotta piddle when a Scottie's gotta piddle. So, we did our usual dance number when Scottie Mom came up the stairs and hurried out the door in our rain gear for our evening walk. That's when Scottie Mom surprised us and let us jump in the Scottie Mobile for a ride. Turns out, we took a field trip to the local pet store and she let us select our dinner with our snouts. We just had to go with a moist food option this once! 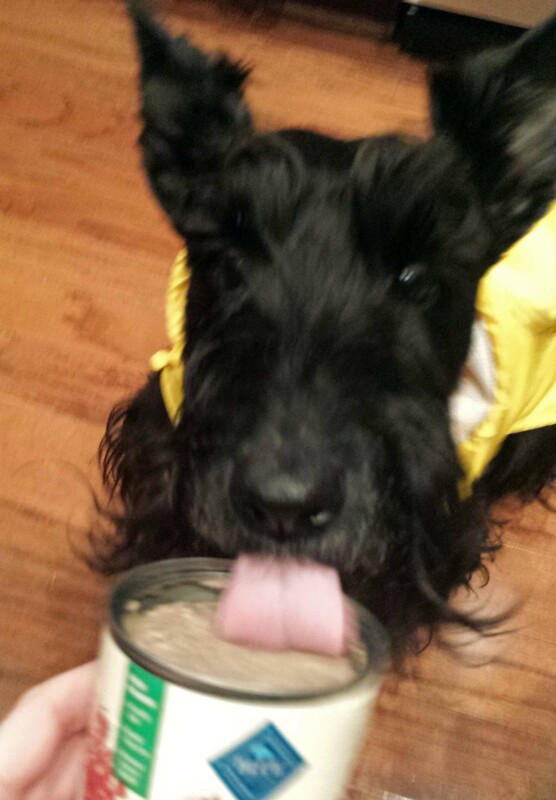 Scottie Mom didn't put up a fight and bought us a can of moist food along with a new bag of kibble. She must have been feeling extra guilty. Apparently, the lady at the checkout was feeling guilty, too - or maybe Scottie Mom bribed her? - because she offered treats without us asking! She said we looked darling in our raincoats that she just had to give us a little something. Hmm. Maybe we're on to something there. 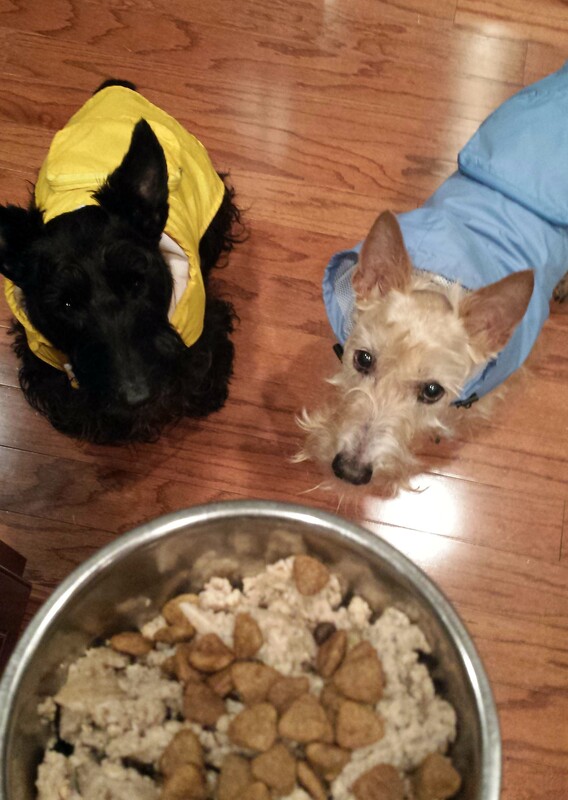 Wear a cute raincoat = get extra treats and a special dinner for two? Yes, please! 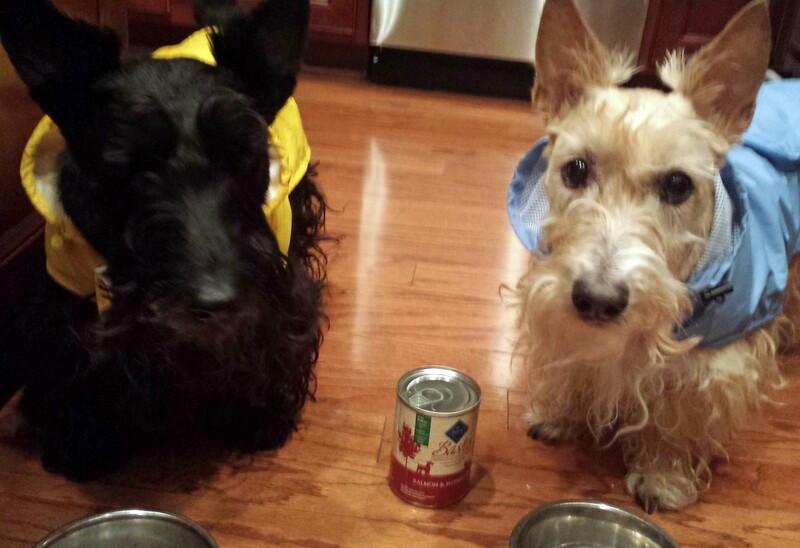 This Wordless Wednesday, Mr. K and Heather are letting their fashionable cuteness speak for itself as they show off the accessories Scottie Dad bought them for Christmas. Mr. K is modeling a dapper purple and white argyle bowtie and Heather is showing the world that yes, all girls do love flowers - even pink ones that fit on a doggie collar! Scottie Dad chose the accessories well, don't you think? You hear that, Scottie Mom? Something's in there! While in New York, Heather and Mr. K made themselves at home with Scottie Dad's family. They had a room all to themselves with comfy doggie beds should they want a quiet place for an afternoon Scottie nap, and they were given free range of nearly the entire home for much of the day. At night, they would retire with Scottie Mom and Dad but during the day, Heather and Mr. K were free to go anywhere they pleased...except behind a certain closed door. 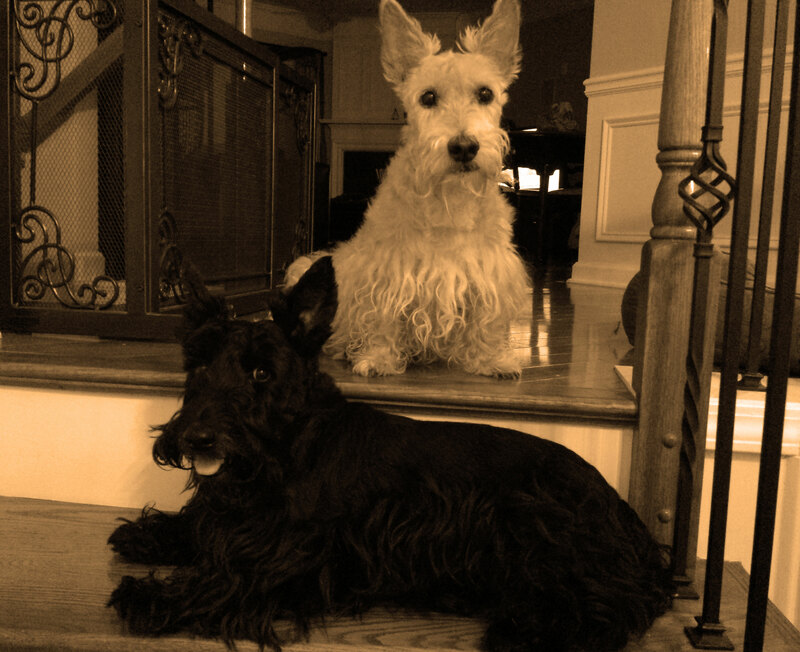 Naturally, any time you tell a Scottie he or she cannot do something, it only makes them want to do it more. Such is Scottie-tude, right? This certain closed door caught Mr. K's attention the very first time he passed it and attempted to sniff under the crack. Almost immediately, he was beckoned into the living room with a treat but Mr. K knew that he was being lured away for a reason and vowed to keep a careful eye on the certain closed door during the entire trip. Strange noises would come from behind the closed door from time to time. A knock here. A thump there. And a jiggling of the doorknob every now and again. When people would open the certain closed door and step inside, the sounds seemed to intensify. Those noises were especially strange and Mr. K could never quite make them out. If everyone who goes inside with these strange noises came out okay, Mr. K decided, then the noisemaker couldn't be of much harm. One night, Scottie Dad and family were sitting on the couch watching TV in the living room. Scottie Mom was writing Christmas cards at the kitchen table and talking to Scottie Grandmadre on the phone. Heather was asleep by her feet and Mr. K went to make sure all in the living room were safe. He stopped at Scottie Dad's feet to let him give a good scratch behind his Scottie ear. That's when it happened: the certain closed door opened. Slowly, very slowly. There wasn't much light but Mr. K could see the dark figure approaching when suddenly, it stopped at the sight of Mr. K.
The two stood there staring at each other. Mr. K began to shake. Scottie Dad looked to his left, saw the dark shadow and leaped off the couch yelling, "Mystic!" Mr. K took off running. Scottie Mom knew what had to be going on and dropped her phone in the midst of her conversation, throwing herself on the floor so she could catch Mr. K. This cannot be happening, she thought. Let's take a moment to explain: it is a well-known fact that Mr. K doesn't like C-A-T-S. In truth, he cannot stand them and has an uncanny way of knowing when they're around even when they are out of sight. Mystic is the family C-A-T, who apparently is so smart, he knows how to open doors even when his people have taken very good measures to make sure he can't let himself out. All Mystic wanted was to get a peak at his house guests and say hello. Then, as cool-mannered as he was when he walked out the door, he turned around and casually walked himself back into his room, having accomplished his mission. It was then that something occurred to Scottie Mom and Dad: Mr. K hadn't run after Mystic...he had run away from Mystic. In fact, he had run all the way behind Scottie Mom by the time she hit the floor looking for him. He was given the ultimate opportunity to catch a C-A-T as he was nearly face-to-face with Mystic but he chose to run away. Perhaps it was thanks to Mr. K's fear or just plain luck that curiosity didn't kill the C-A-T and Mystic got away. 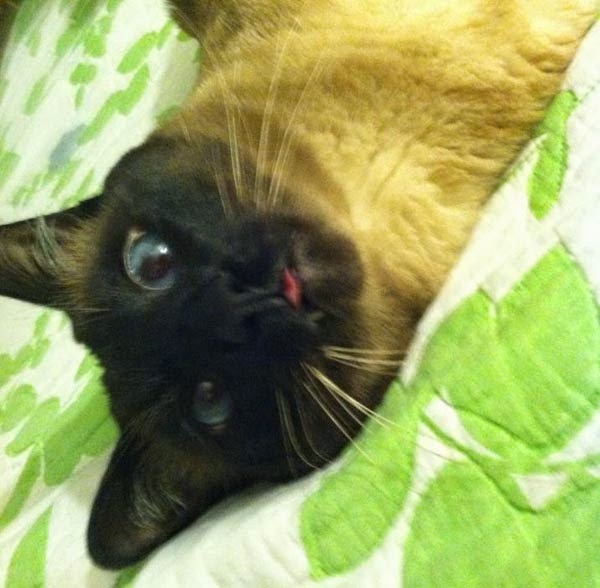 Mr. K had encountered dozens of C-A-T-S before and never reacted that way. He always charged at his enemy. Still, one must consider that if this C-A-T is smart enough to know how to open doors, could it be that mystical Mystic could also put Mr. K in a trance and somehow convinced him to walk away? That, my friends, is something we'll never know. 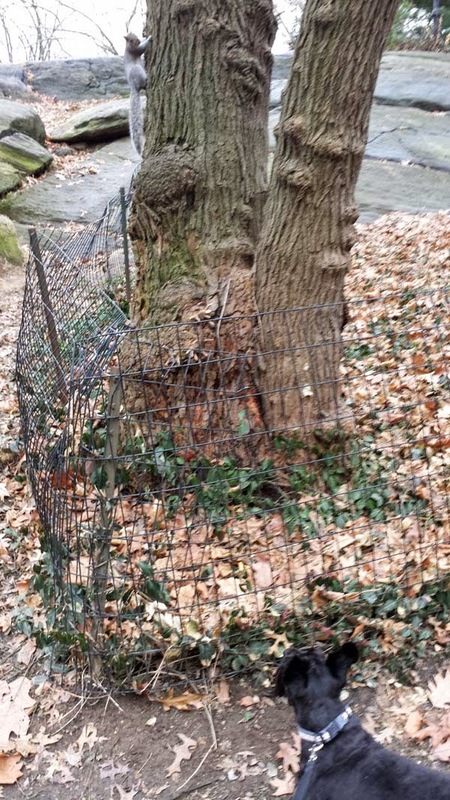 Squirrels, squirrels everywhere...but not a one to catch! Forget the City of Skyscrapers. New York City is the City of Squirrels, friends! Mr. K recently discovered this on our recent tour of the Big Apple. One paw in the park and it was bound to be a struggle to get him back out. It started while posing for photos atop one of the big rocks in Central Park. Heather and Mr. K were doing what they do best: smiling for the camera. Then, a rustling of leaves just behind where they were seated caught their attention. Neither Heather or Mr. K could see anything at first, but they searched the area below where they swore the sound had come. Suddenly, there was another rustling of the leaves. Mr. K pulled on his leash to inch closer to the suspect. What could it be, he wondered? Out came a puffy tail and Mr. K tried his best to break free and run after it. Squirrels! Soon, that little guy was out of sight but it wasn't long until Heather and Mr. K were strolling along peacefully on the walking path when guess who crosses by? The visit to Central Park was one of lots of starts and stops. One minute, Heather and Mr. K would be enjoying the scenery and itching to move on to the next spot. The next minute, they dug their paws in the ground and took off after this squirrel and that (usually in the opposite direction from which they were originally headed). Yes, Heather and Mr. K thought for sure that they would finally achieve their lifelong dream of catching the elusive squirrel during their visit to Central Park. But these city squirrels had been around the block a few times and although they were daring and often cut it close, they were smart and quick on their tiny feet. Time after time, one would dart in front of Heather and Mr. K, only to escape in the nick of time by climbing up a tree. Neither Scottie seemed upset by this. It only made them more driven to accomplish their feat. After a few hours, when it was time to go, Heather and Mr. K went reluctantly but knew they would return to the Central Park of Squirrels with renewed energy and more practiced paws some day soon. 14. Scottie Mom's getting a makeover! In early 2014, we'll be changing the look of ScottieMom.com and adding new features to the site but don't worry - the same great content will be still be available for free. 13. More travels. Heather and Mr. K had so much fun in the Big Apple this year, that we are bound to return to New York...at least twice in the new year. Where else will we go? Well, you'll just have to wait and see or tell us why we should road trip to your neck of the woods! 12. Double the trouble. In a fun way, that is. Heather and Mr. K certainly don't mean any harm (only good fun!) when they steal shoes, socks, undergarments and even the occasion bit of trash from the can if Scottie Mom or Dad leaves the door open. The longer this dynamic duo is together, the more they conspire and share bad habits! 11. A renewed focus on rescue. Every Scottie (and every other dog or cat!) deserves a loving home. 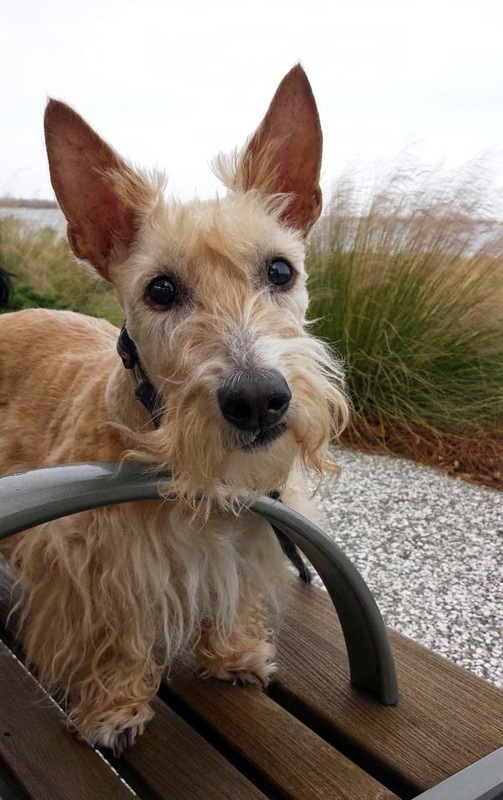 Let's work together to help Scottie rescue organizations get their pups placed. 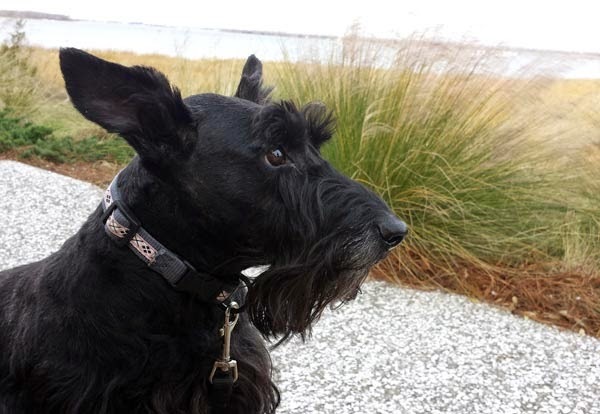 Our goal is to feature one Scottie in need from rescue organizations around the world per month. 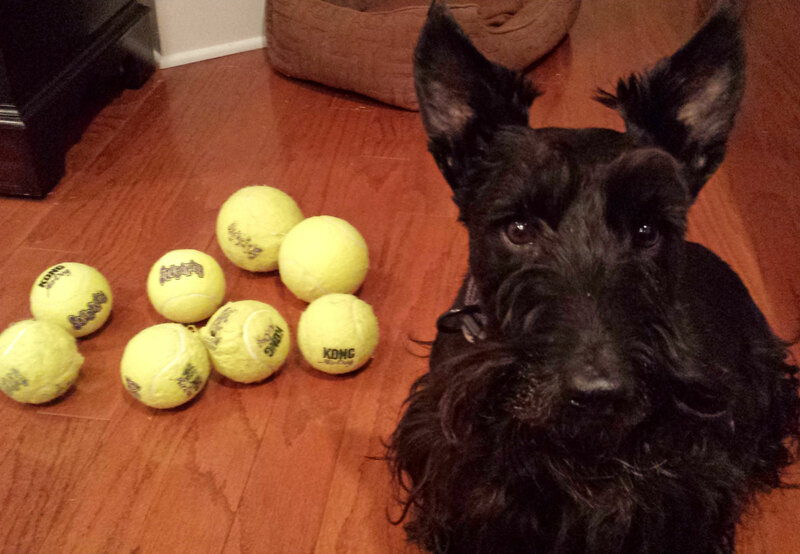 If you know of a Scottie who needs a little help finding a forever home, email thescottiemom(at)gmail(dot)com. 10. Double digits. That's right: later this year, sweet Heather Beather will turn 10 years old! A celebration for this little girl who's now all grown up is in store, for sure! 9. #TooCuteTuesday is here to stay! For a few months now, Scottie Moms and Dads have had the opportunity to showcase their Scotties on the Scottie Mom Facebook page. Heather and Mr. K sure don't mind sharing the spotlight so be sure to send your photos in every week! 8. Various videos. 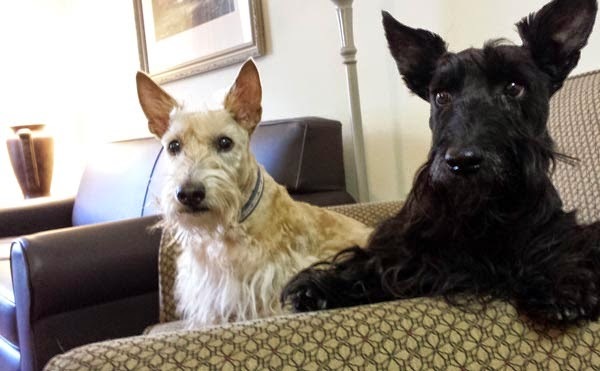 You've seen Mr. K shake his Scottie stocking full of squeaky tennis balls until it was empty and the dynamic duo give you a tour of The Scottie House. This year, Heather and Mr. K are determined to create more videos to let their friends see them in action. 7. A multitude of Scottie Love. 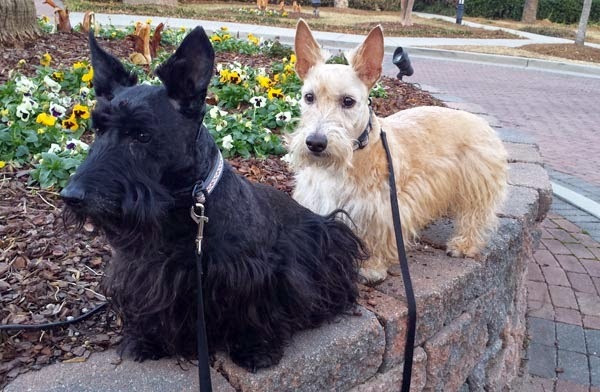 Does your heart belong to your Scottie(s)? Of course it does! This Valentine's Day, all Scottie Moms and Dads are encouraged to show some Scottie Love and submit your "gotchya" stories of how your Scottie came into your heart and your home. A lucky few will be profiled right here on the blog. 6. The unexpected. There is simply no way to predict the future, especially with Scotties around. One minute things might be tranquil, the next there could be zoomies up and down the hall, a squirrel to chase or an ArRRoO alarm to sound. You just never know. 5. More laughs. Rest assured, Mr. K may be middle-aged but he is nowhere near retirement from silly Scottie shenanigans. He promises a year full of surprises, mischief, trickery and more. 4. Another spooktacular Howl-o-ween Pawty! Last year, so many Scottie friends dressed in their best Howl-o-ween costumes and flaunted their cute Scottie selves. Why not do it again this year? This kind of fun is super sweet, but calorie-free! 3. The cutest photos. Ever! Ok, let's be honest: Scottie Moms think all photos of Scotties are adorable so this resolution might be a little subjective. 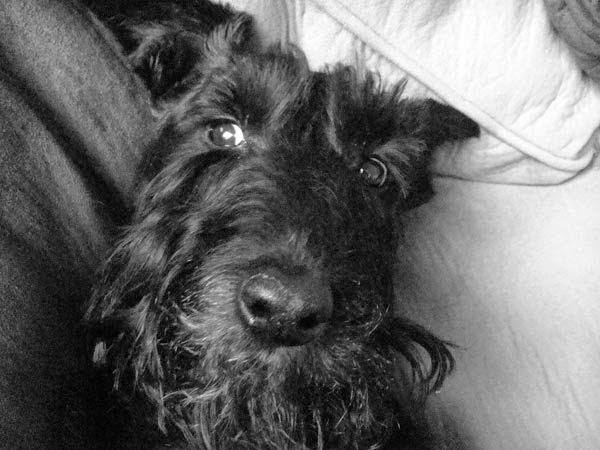 What I can promise is lots and lots of Scottie photos, which means lots and lots of Scottie cuteness. 2. More Scottie must-haves. 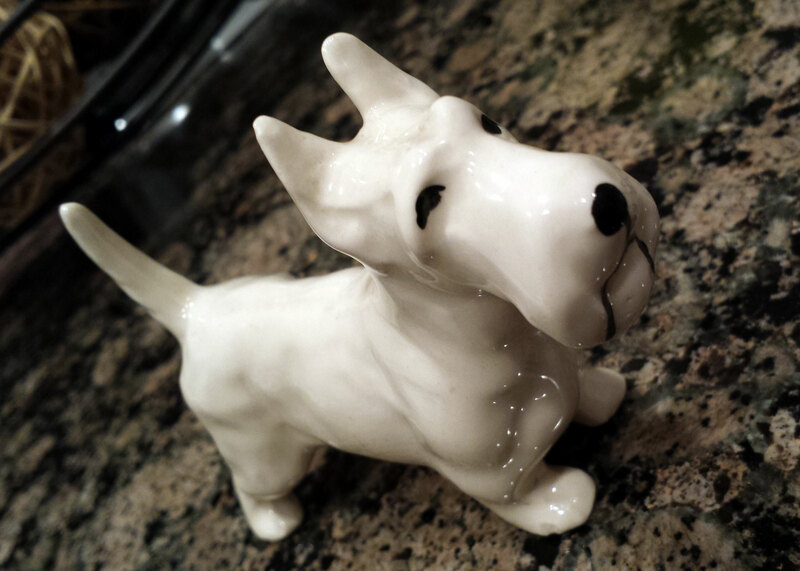 Every Scottie Mom loves a good Scottie find! We'll continue to hunt down those precious Scottie items in stores and share our finds on Facebook...we may even premiere a few we've been working on ourselves! 1. A Scottie Mom Wedding! Just before we ring in the year 2015, we'll be tying the knot in New York City. What will Heather and Mr. K's role be in the wedding, you ask? That's yet to be determined...but I see a pretty Scottie girl in white and a sleek Scottie boy tuxedo in the future!